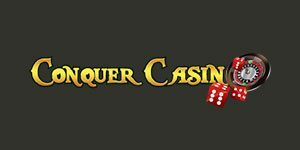 Conquer Casino will then reward you with a bonus (Welcome Bonus is for new players only). The terms and conditions of the bonuses vary between different casinos and might also change over time and between different countries, so it is important to compare the different offers and read the T&C for Conquer Casino before signing up. From the moment you enter Conquer Casino, you will feel like a warrior thanks to its theme and details designed in royal red. As soon as the casino loads, you will be welcomed by three heroes promising some epic entertainment. Being online since 2012, the casino has come a long way from a stand-alone Microgaming gaming establishment to a gaming venue powered by the biggest names in industry and offering hundreds of casino games. Available on desktop and mobile devices, Conquer Casino treats all its new customers with a generous welcome package and provides its players with a reliable support and an overall safe and fair gaming experience. The Malta Gaming Authority and UK Gambling Commission monitor its operations and guarantee that the casino complies with the high industry standards. With no download needed, you can access the gaming content at Conquer from your computer, smartphone or tablet. It runs on a multiplatform powered by the industry leaders such as Microgaming, NetEnt, NextGen Gaming and more. Players can choose from more than 300 casino games by opting for the online version of the casino. Its mobile counterpart offers fewer titles, but still a diverse enough selection of games to choose from and have fun on the go. Slot machines comprise the vast majority of games at Conquer Casino. With new titles added to the portfolio as soon as they are launched and all time favourite games, the gaming venue will please all kinds of players. If you like good old games, you can enjoy the titles like Starburst or Gonzo’s Quest. Players who prefer trying new stuff will be impressed to learn that the brand new title with innovative features like White Rabbit by Big Time Gaming or Kaiju from ELK Studios are available too. In the Jackpots Games section you can play progressive slots like Treasure Nile or King Cashalot that can award life-changing sums. In the Roulette section of the casino you will find 11 virtual tables including 3D European Roulette as well as the French and American versions of the game. In the footer of the website you will find links to the Blackjack section housing 9 variants of the game including Premier and Gold Series. The gaming establishment offers 10 scratch card games such as Foxin Wins and Irish Eyes Scratch. Live Casino is the latest addition to Conquer Casino and players can access it from their desktop or mobile devices. At Conquer, Live Casino is powered by NetEnt with tables like Live Automatic Roulette and Blackjack Common Draw High Roller on offer. There are other Blackjack and Roulette as well as Baccarat tables available too and whichever of them that you join, you can immerse yourself in the genuine casino action. Conquer Casino accepts payments via a wide array of banking methods including major credit and debit cards like Visa, MasterCard and Maestro, e-wallets Neteller and Skrill, local solutions such as iDEAL, Sofort and GiroPay, QIWI, PaySafeCard, Trustly, WebMoney, Euteller, Fast Bank Transfer and Pay by Phone. Players can deposit from £10 up to £5,000 depending on the preferred method, while a minimum withdrawal is set at £20 or £50 via Wire Transfer. Up to £3,000 can be withdrawn per week and £6,000 per month. Cashout timeframes vary from one method to another with requests being processed within 24 hours up to 10 business days. Accepted currencies include GBP, USD, EUR and SEK. Conquer Casino prides itself with round the clock customer support via online chat and email. Make sure to find all needed answers under the comprehensive FAQ section, but if you fail to, feel free to reach reliable support agents available 24/7/365. You can also follow the casino’s activities on Facebook and Twitter where they advertise their promotions.